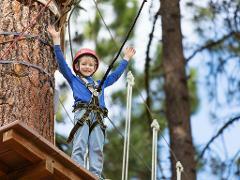 The ultimate treetop experience for outdoorsy adventurers. Do Mountain Bikes as well and receive $10 discount! The ultimate treetop zipline and free falls for outdoorsy adventurers. Groups of 10 get discount. 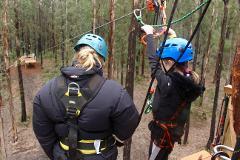 The ultimate treetop climbing adventure for outdoorsy adventurers. Groups of 10 get discount. Have you got a little one who's not quite big enough for our full sized adventure experiences? Let them go wild with our all inclusive experience that sure to drain the battery for a peaceful drive home. 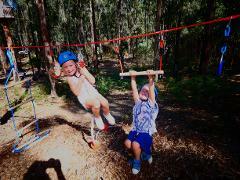 The ultimate party treetop experience for outdoorsy adventurers. 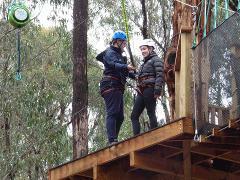 The ultimate treetop experience for outdoorsy adventurers. Group prices - Minimum of 10 riders. Do Mountain Bikes as well and receive $20 discount! This gift card entitles the bearer to one KFA Treetops Experience and is valid for a period of 12 months from purchase date. This gift card entitles the bearer to any online KFA experiences up to a value of $15. Usually this giftcard would be used for a Littlies Forest Adventure experience.